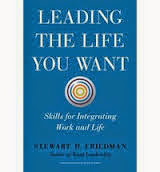 We're finishing off our series on the new book "Leading the Life You Want: Skills for Integrating Work and Life," by Stewart Friedman of the University of Pennsylvania Wharton School. This is a brief journaling exercise he lays out. Give it a try! Just as a scientist keeps a roster of ideas for experiments, try keeping a journal or log for a few days. Record any hypotheses that occur to you for new ways of getting things done, especially if they would benefit different parts of your life and help you design the kind of life you want to lead in the future. Think of these as experiments; you are a scientist, with your life as your laboratory. Don't judge your ideas. Use this opportunity to come up with options for things you might do differently. Now choose one such idea to implement. It could involve a new activity, such as getting feedback from end users of a prototye you're developing . It couls also mean stopping or reducing something you're already doing, such as checking your social media accounts fifteen times a day. What assumptions about the way things are now would you have to challenge in order to move forward on these actions? Who could you talk to about your thinking? Who can help you understand your assumptions and implement the idea successfully? Perhaps you're anxious about getting feedback on that prototype. You decide to talk it over with a friend. He persuades you to see that your fear of discovering that it's all a big waste of time is misguided and that any critique of your model will give you what you need to improve it. ...As studies on the theory of "small wins" have shown, thinking about our assumptions and then designing incremental steps to create change can give us greater confidence to question the status quo. My suggestion would be not only to use journaling to identify your ideas at the outset of this exercise; but continue to use journaling to record your progress, identify setbacks, and keep track of realizations you have along the way. ← More on journaling in "Leading the Life You Want"